St. Augustine, Florida, founded in 1565, is the oldest continuously occupied city and port in the continental United States and it is also home to the first lighthouse established in Florida. When the United States gained possession of Florida in 1821 one of the first items of business was to establish a beacon in the oldest port. The Spanish authorities had maintained a watch tower on the north end of Anastasia Island since the 16th century. When the US decided to build a lighthouse they first surveyed the old coquina tower to see if it could be adapted for use as a lighthouse. 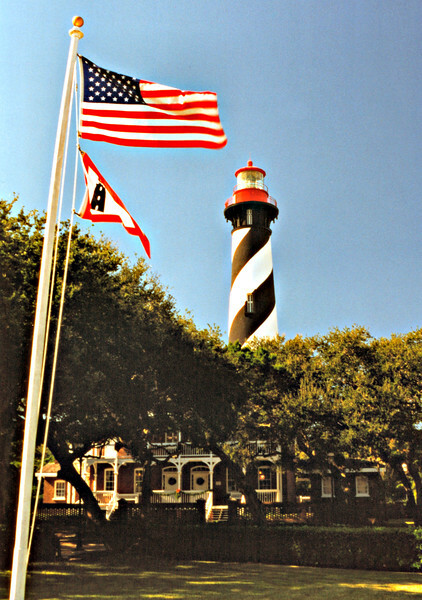 In 1823 the Customs Collector for St. Augustine advertised a contract to build the lighthouse. The contract specified that 20 feet of the Spanish watch tower was to be removed, and then walls of 30 feet were to be built on the remaining portion. Work commenced in the fall of 1823 and after a few delays caused by the shortage of construction materials and oil, the lighthouse was completed in March 1824.